Jeep #12: Back at it! We’re back at it after letting the Jeep #12 sit during the cold and long Winter here in Minnesota. I didn’t drive it much during the Winter, though there were days where I certainly should have! 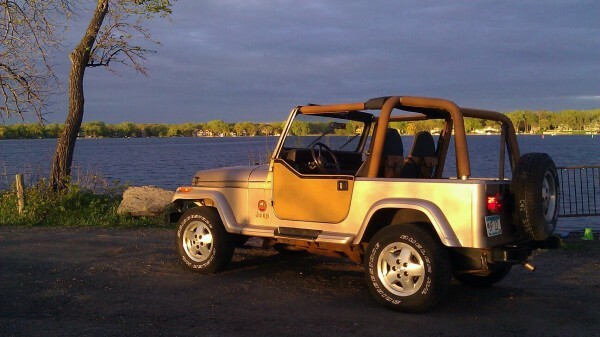 Now that the temperatures are finally raising up to the point of being able to drive with no top, the Jeep is once again becoming active. I took the hard top off and the hard full doors. A friend found a set of almost brand new soft doors at a local junkyard and at only $80 they were a bargain. Up next is figuring out the wiring issue that may or may not still be affecting the headlights. Followed by painting the replacement fenders and windshield frame. After that it is time for the bodywork and (eventually) paint! Hopefully we can get this thing done this summer!